Discover the fantastic world of these magic cats! Dive into the Shinycatz' world and discover these cats and their magic powers! 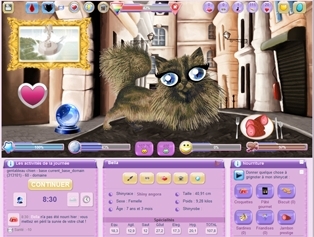 Look after one or several Shinycatz', help them progress in the game and play with the Shinycatz' of other players in fabulous adventures in the streets of Paris. Avoid traps set by the mean Badcatz' and the evil Violaine and take good care of your furry proteges! Get away from it all for the month of Sweden on Shinycatz! It’s Christmas all over again on Shinycatz: the 7th sense bonus for just 1 premz' (limited offer)! Gifts for your cats every day until December 25! Shinycatz is doubling your premz' to celebrate the new version of the game! New version of Shinycatz: the first step has been completed!